The report says that the sustained rallies in emerging market equity and external debt markets since early spring are only partly the result of improving fundamentals. “Our Emerging Market Bond Index Global spreads model indicates that the decline in sovereign debt spreads has been driven almost entirely by improved global risk appetite and core market liquidity," it says. IMF notes that property and equity prices have appreciated in some Asian countries at an early stage of the economic recovery, partly as a result of liquidity inflows from mature markets. “Given the risks, policymakers in the region should be prepared to further withdraw monetary stimulus when the ongoing economic recovery is firmly established to avoid risks associated with the build-up of asset price bubbles," it warns. The report notes the challenges to global growth, particularly in the developed world, and also says that banks in the developed countries will continue to face substantial write-downs. It says that for these banks, “stronger earnings are not expected fully to offset writedowns over the next 18 months, resulting in continuing capital pressure". The implication is clear. Money that had rushed to the safe haven of US money market assets after the collapse of Lehman Brothers Holdings Inc. is rushing out, pushing up the prices of risky assets. In the process, the US dollar, too, got hammered. 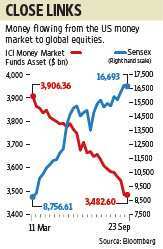 The chart clearly shows the relationship between the supply of liquidity from the US and the impact on the Sensex. It’s not just asset prices that benefit from liquidity. Rising liquidity has also helped companies, as they have raised capital and rebuilt their balance sheets, which in turn will raise earnings growth and help improve the fundamentals. Wednesday’s Purchasing Managers Index data from China and Japan for September shows that the recovery in manufacturing continues to be strong and manufacturing employment is expanding in China. What will happen when the liquidity taps are tightened? Much depends on when the tightening takes place. If growth is strong, even rising interest rates may not hurt, as we saw during the last boom. It’s true that valuations are high, but as a recent global strategy report by Morgan Stanley put it: “With risk assets in a sweet spot (growth momentum improving, rates on hold and liquidity measures plentiful) for at least the next two quarters, we think the market will trade away from our fundamental valuation before growth and earnings concerns resurface and potentially disappoint expectations built in equities."